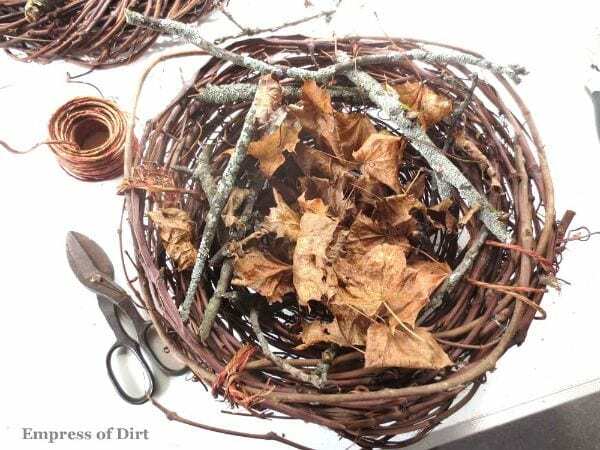 Turn an old grapevine wreath into a garden art bird nest with this simple tutorial. 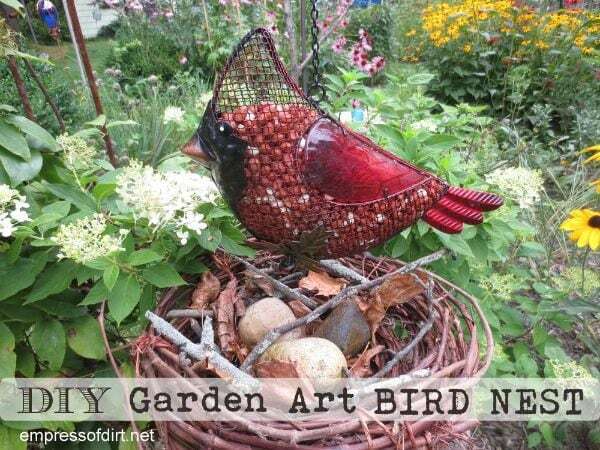 If you love big garden art, also see this DIY Giant Bird Nest (with eggs). 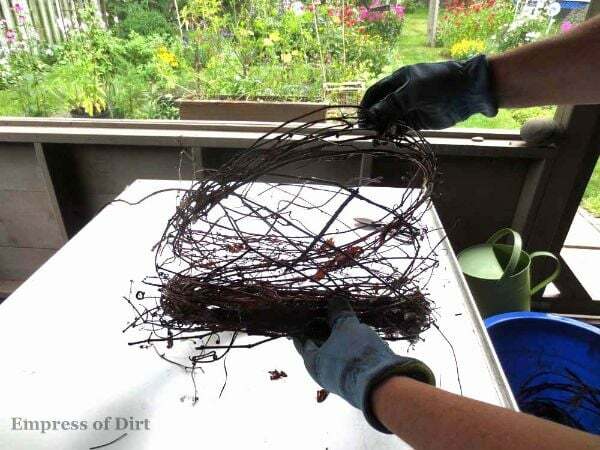 This giant bird nest is an easy, repurposed garden art project. I got the idea when I noticed a rock in my garden looked like a giant egg. I thought it would be fun to have a giant bird’s nest to go with it. 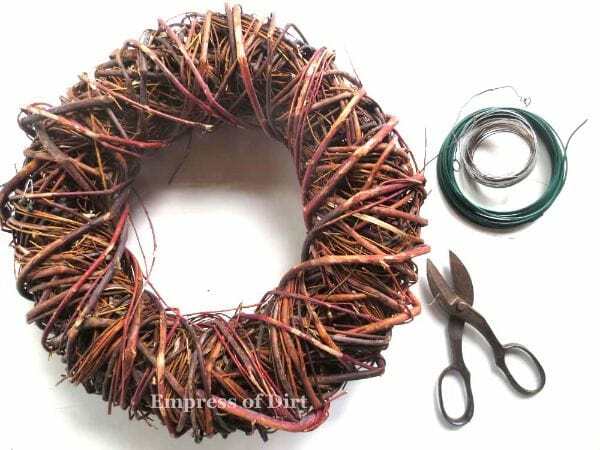 You’ll need a couple of unwanted grape vine wreaths and some matching wire — the larger the nest, the more wreaths you’ll need. 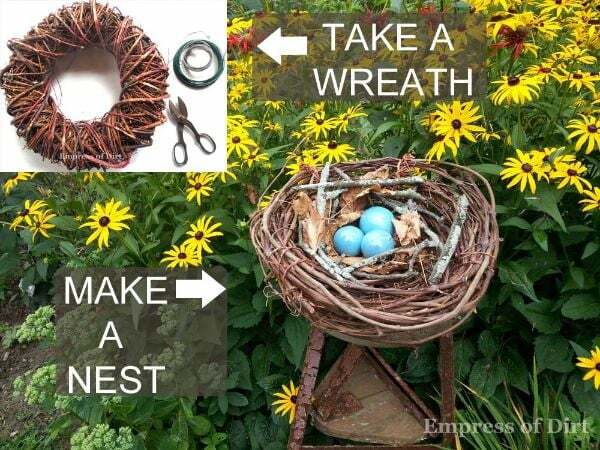 The initial preparation of the wreath takes 24 hours (while you wait for it to soften up) and the assembly of the nest takes about an hour. With the declining popularity of wreaths in recent years, you should be able to find some used ones at a thrift store. I’ve also had several emails asking where to find the cardinal peanut feeder pictured here. I bought mine at a local farm supply store. I haven’t seen any online but you could try a local bird seed and supply shop or crack open Google and see if you can find one. 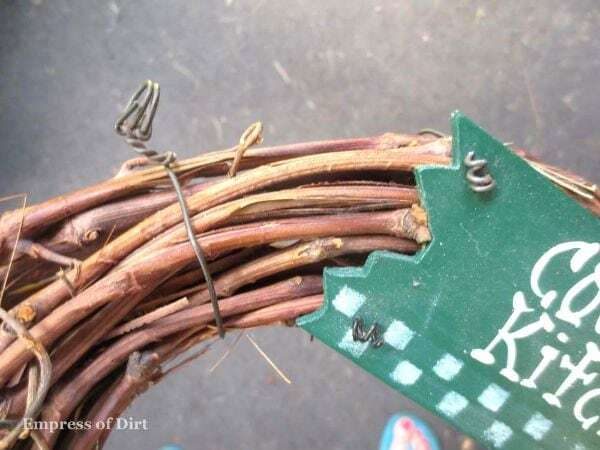 Besides a giant nest, there are other creative options: you could make smaller nests or something entirely different such as a garden sign using the grape vine to spell the words. The giant nest is a perfect first project to get a feel for what it’s like to shape the grape vines. 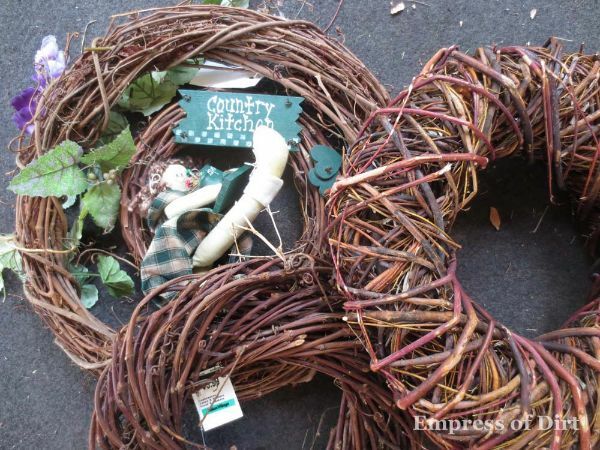 The wreaths shown here worked very well – they are made of long grape vines stems, wrapped around each other. To get started, find any wires holding the wreath together and remove them. 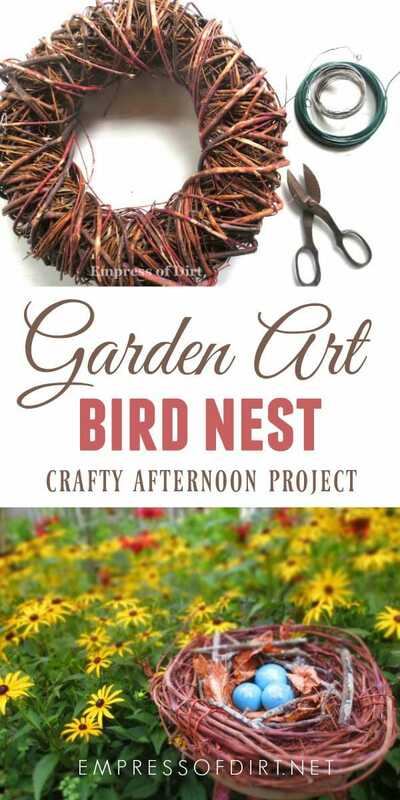 You can reuse these wire pieces for your bird nest assembly. When all of the support wires are removed, soak the wreaths in a large container of water for at least 24 hours (a few days longer is fine too). This will soften the grape vines so they will be fairly bendable without snapping. Add something heavy like this watering can to ensure that the wreaths stay fully submerged and do not float to the surface. After soaking the wreaths (24 hours or more), it’s time to make your nest. The grape vine stays bendable for an hour or so and then gradually stiffens up again as it dries. Gently unravel the vine until you have several long pieces. 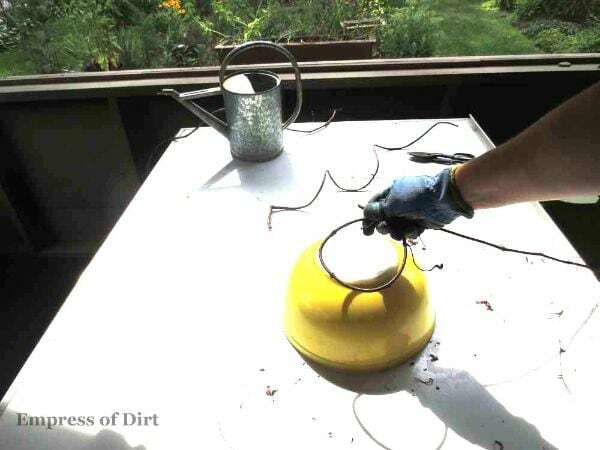 You may want to use a large bowl (like the yellow one pictured below) to have a model size to base your nest on. 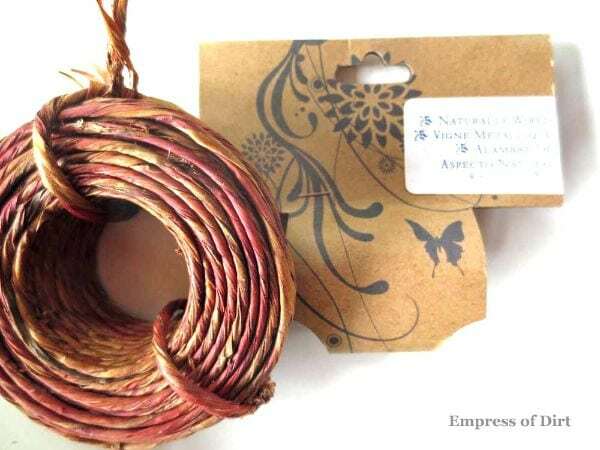 I found this covered wire at Michael’s—it goes nicely with the colour of the grape vine. 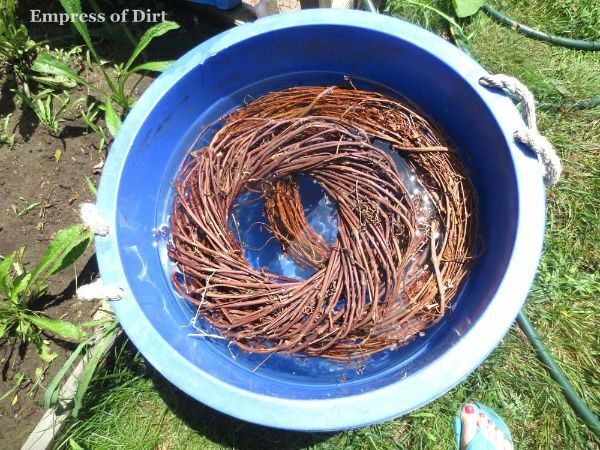 Start winding the grape vine in circles (this will be the bottom center of the nest), starting with the smallest circle you can make without snapping the vine. As your work, hold the sides together with clamps. I added wire as I worked, winding it around sections of the nest and tucking in the ends. This is where you get new respect for how hard a bird works, although their methods are a little different! 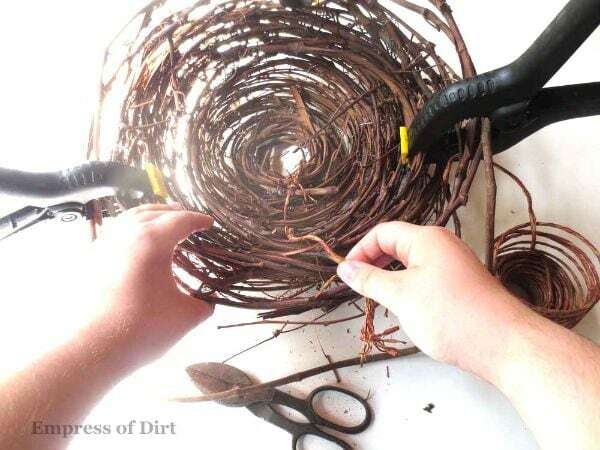 When the nest reaches the desired size, finish joining it with wire until everything is securely in place. I added twigs and leaves to give it a more natural look. 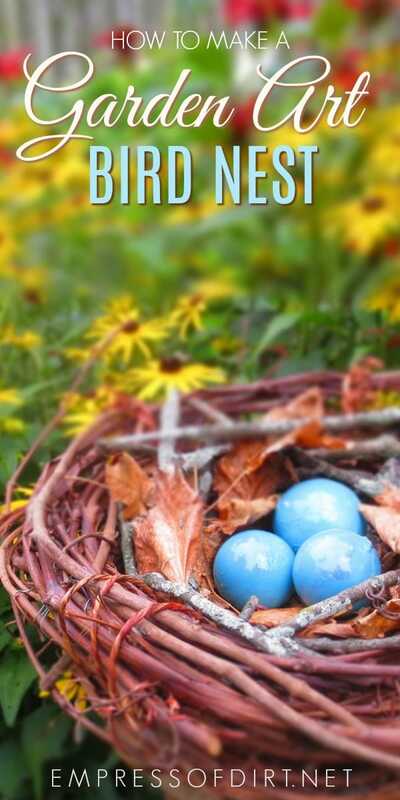 We all have nesting instincts! Three blue eggs! I actually spray-painted a few decorative balls blue. 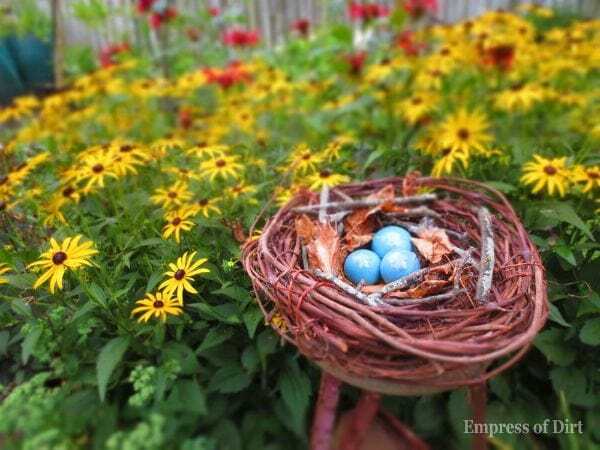 Alternately, decorative eggs – painted and splattered with speckles would also look great. I’m quite pleased with my giant nest. Now I just need to make a giant bird to go with it. 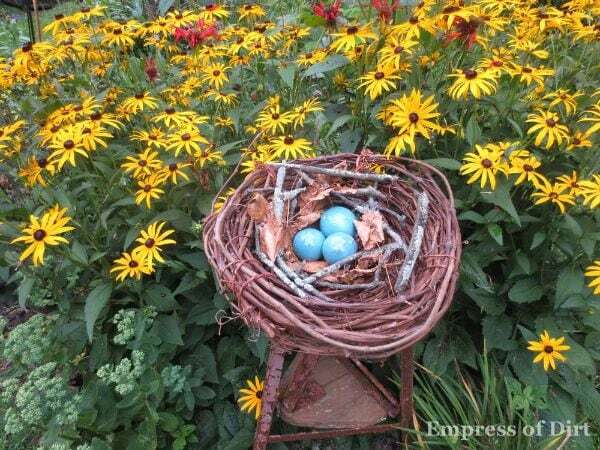 I love your big bird nest..hey like the saying goes..go big or go home…I really enjoy reading yr different blogs…I love gardening and live in South western Ontario so I do get some gardening time in..? I love this project! 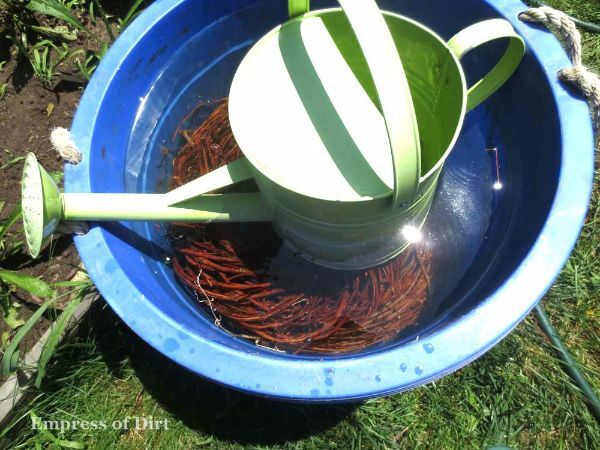 I didn’t know that it would be so easy to soak and re-use the vine. I’m considering doing some art with the vine (using a board and nails) so this definitely helps! I read some queries as to where you got the Cardinal bird feeder. I bought one two summers ago at a Home Hardware store. I hang it in the winter filed with sunflower seeds. The chickadees, nut hatches, grey jays and others love it. What a cute idea Melissa. Always wonder what to make out of all those ugly wreaths I see at garage sales and 2nd hand stores. Now I will start picking them up. I raise outdoor birds and this would add at special touch in their living room. Thank you for sharing. That would look really cute with the outdoor birds – please show me a photo if you ever make some! Love it Melissa..yes it is so easy and cheap to find those wreaths now! Love it! Off to finally finish my own project, which got stalled due to lack of inspiration – thanks for the boost! I look forward to seeing what you create – thanks Jacki! I love this idea! I have several grapevine wreaths around including a giant one I used to hang over the garages at Christmas time. My giant nest will be seen from the road! Thank you. It would be so fun to make an ernormous one – might have to stockpile some wreaths… Thanks Patty!